This article contains spoilers for the Supergirl season three episode – In Search of Lost Time. Supergirl — “In Search of Lost Time” — Image Number: SPG315b_0073.jpg — Pictured (L-R): Melissa Benoist as Kara/Supergirl and Chris Wood as Mon-El — Photo: Jack Rowand/The CW — ÃÂ© 2018 The CW Network, LLC. All Rights Reserved. Tonight’s episode of Supergirl hit a bit close to home for me as I can imagine it will have for many of the audience. The main story focused on the mental deterioration of M’yrnn J’onzz (Carl Lumbly) and how J’onn J’onzz (David Harewood) tries to help him. Dealing with an aging parent is one of the most heartbreaking things anyone has to go through. It’s something I’ve dealt with a lot lately and the story rang so incredibly true to me. The story of course has the added fantasy aspect that M’yrnn is a Martian with psychic abilities that are leaking out and making people act extremely aggressive towards each other. 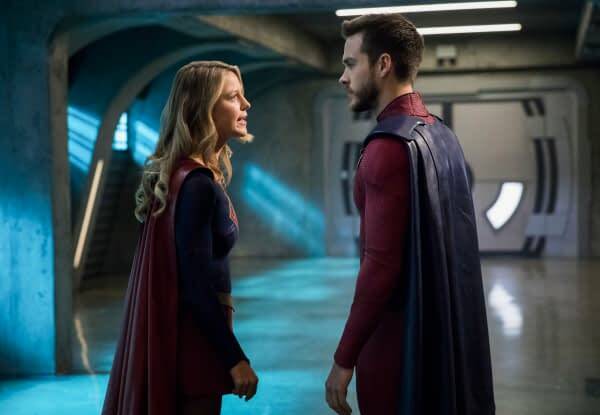 It caused members of the DEO to attack each other and forced Kara (Melissa Benoist) to says things to Mon-El (Chris Wood) that she had been holding back. After the first incident that made another psychic alien go “Road House” on Supergirl, J’onn had his suspicions and took M’yrnn to the DEO. The second one leaked out into the building and turned folks on each other in the building. Winn (Jeremy Jordan) fixed Mon-El’s original suit and he puts it on to start training Kara in tricks using her cape. Turns out that it’s a special Kryptonian material that can be used as a weapon. Something Mon-El has become an expert in. But Kara gets frustrated with she doesn’t get the moves down quickly and that, along with M’yrnn’s push, sets her off on Mon-El. Later when J’onn tries to put a dampener on M’yrnn, he loses it and his psychic waves turns everyone against each other and somehow releases all the alien prisoners including a White Martian. Supergirl, Alex (Chyler Leigh), Mon-El and Winn work to get the aliens back and people calmed down while J’onn has to take out the White Martian and get his father to agree to the dampener. The side story follows Lena Luthor (Katie McGrath) as she tries to help Sam (Odette Annable) accept that she is actually Reign. Sam refuses to accept it until Lena gets her to transform and then shows Sam the footage. It’s another pretty rough scene in a very emotional episode. James (Mehcad Brooks) is trying to be supportive and shows up at Lena’s office twice, once because he hadn’t seen her in a week and then a second time just to bring her dinner. It’s going to be interesting to see how their relationship stands after it comes out that she knows Sam is Reign. The performances of Harewood and Lumbly were brilliant and the writing for the episode feels like it was written from a place of experience. It’s an interesting pairing with the last issue that also felt somewhat personal with the issue of Winn’s mother. But that may just be a concidence as the next issue will likely be a far more action-packed episode with the introduction of the third Worldkiller, Pestilence. There is one issue that didn’t come up, yet it seemed like the question that should have been asked immediately when Mon-El first appeared in the new suit. Why does it look like he had a House of El logo on his uniform chest and now it’s been removed, leaving the outline of the symbol? That would’ve been my questions immediately.